The Tooth fairy is coming! The Tooth fairy is coming! Today we hit a milestone. Chanel lost her very first tooth today, and I think that she pulled on it before the tooth was ready to come out. She has been a little desperate over the last few days for money…apparently she has a list of things she is saving for and it seems that she is happy to sell her teeth for them. After the tooth ‘came out’ Chanel tried to to convince me that the rate for the tooth has gone up. 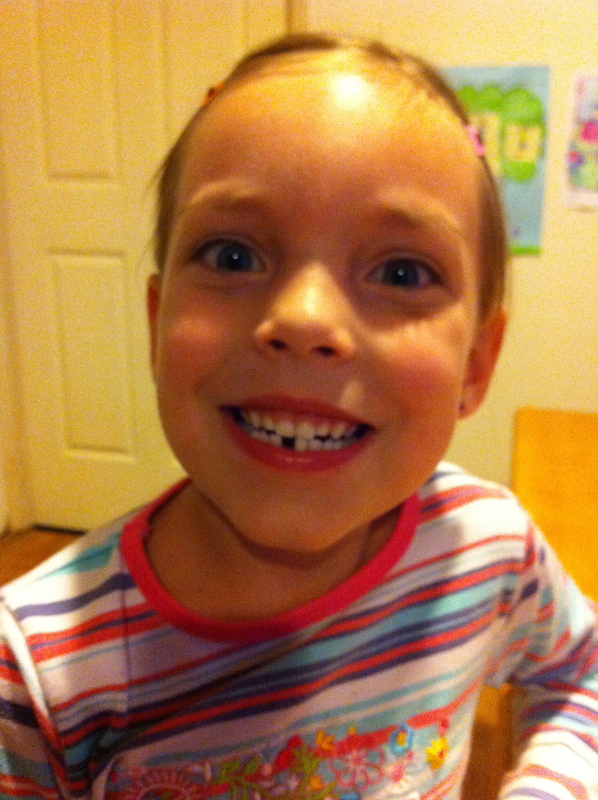 She thinks that the Tooth fairy has come into some money and the first tooth should get her $20. Let me just say that there is no way that the tooth fairy can afford Chanel’s list….this kid has expensive taste and we are going to have to curb the tooth fairy in terms of how much she gives! Its always been a $5 note for the first tooth, and sadly as the other teeth fall out…we have lowered the price to about $2 and if they are lucky $3. Oops, I mean the Tooth Fairy has always only ever given $5 for the first and $2 or $3 for the others. Isn’t this child sooooo cute!